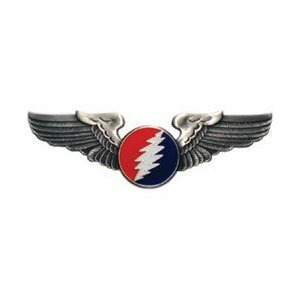 Fly the grateful skies with these Grateful Dead pilot wings pin. Small Red & Blue Circle with Grateful Dead lightning bolt pilot wings. Officially licensed by the Grateful Dead® and made by a deadhead pilot,these wings will keep you flying high. Wingspan measures approx. 1 1/2".